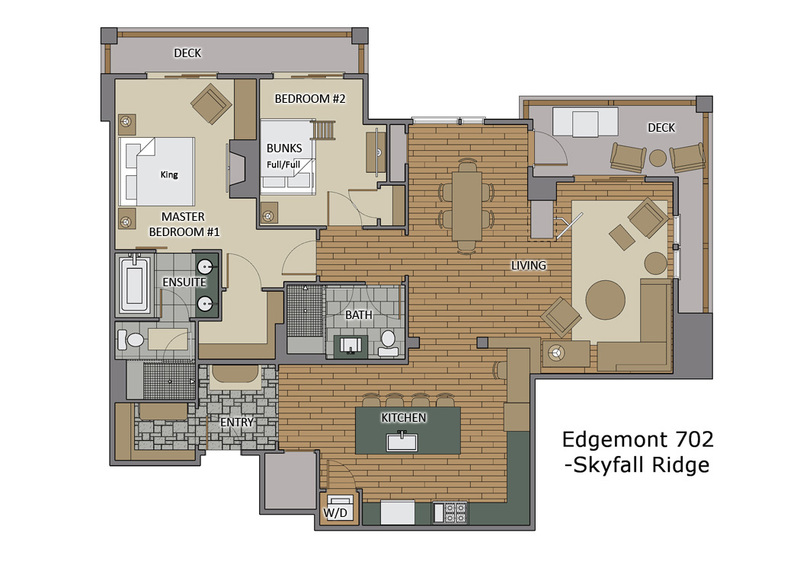 Skyfall Ridge at Edgemont offers spectacular ski access to the Steamboat mountain and a relaxing private setting for a family or couples ski trip. This stylishly appointed two bedroom residence at Edgemont offers convenient ski-in/ski-out access and great views of the ski mountain and the pristine Yampa Valley. The fully equipped kitchen makes entertaining at home a cinch. The comprehensive culinary equipment includes a 6-burner Viking Range and GE Monogram appliances so that chefs of all levels will feel at home. For meals together there is seating for 6 at the dining room table and an additional 3 at the kitchen bar. Staying here you will relish the experience of a place to call “home” in the heart of the Colorado Rocky Mountains with all the comforts and conveniences you could hope for. Both bedrooms offer private bathrooms. The master offers a King bed with fireplace. The second bedroom offers two full bunk beds. A twin EZ-Bed provides additional convenience to larger groups. Edgemont's on-site amenities include the fabulous heated outdoor pool and hot tub with great views down the mountain. The outdoor fire pit is a natural gathering place and kids will delight here in s'mores and hot chocolate. Ski access could not be much easier with a slopeside ski locker room. Here you can dry off and conveniently store your equipment in your private ski locker with enclosed boot warmer. If you need to push yourself a little more, there is exercise equipment onsite. Absolutely stunning and the best family trip for us! The amenities were top notch. The location could not be beat and I’d live there in a heartbeat! Our family of 4 absolutely loved at our stay at Skyfall Ridge recently. It is a beautifully appointed condo with plenty of room and a fantastic kitchen which is well set up for those that like to cook. The two bedrooms are spacious and very comfortable. The main bedroom has a large king bed, fireplace, walk in robe and large ensuite while the second bedroom accommodated our teenage kids well with a large bunk bed set up. Both rooms had TVs and nice views towards the gondola. There is large dining room and adjoining lounge area with fireplace and TV and lovely views towards the gondola and also down the slopes back towards the mountain base. The location is also very convenient for ski-in and ski out although if you ski out down to the gondola you do have to take your skis off to catch the gondola back up the mountain. The alternative would be to catch the Christie lift and navigate the mountain another way. For those not skiing, you can walk down the hill to the mountain base area. The walk back up, while still not too bad, is a little steep but manageable. It is a much better option than trying to walk down via the road network. Having said that, the Moving Mountains team and The Edgemont provide excellent and prompt shuttle services that can take you down the mountain or into town for dinner or exploring. There are some lovely restaurants in Steamboat Springs so we often found ourselves in town for dinner (using the shuttle) although there are some pretty good options also on the mountain. We would absolutely stay here again, it is a beautiful condo and a great ski hill. From the staff, to location, to the home itself, don't miss out on the ideal slope side stay. It was PERFECT!